The five officers have been fired, Mayor Larry Langford said at a news conference Wednesday. An internal inquiry is continuing. 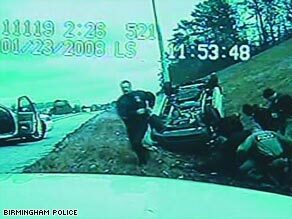 The dashboard-cam footage, which officials believe was shot in January 2008, was aired for reporters Wednesday. It showed the end of a 100-mile-an-hour police chase of a van driven by Anthony Warren, suspected of illegal drug activity. Police had chased the van almost 50 miles, winding from downtown Birmingham to suburban Hoover. The video captured the van knocking down a police officer standing on a roadway, then turning up an interstate highway ramp, where it flipped over and rolled into a ditch. Warren was ejected from the van and stopped moving. The five officers — one black, four white — ruthlessly beat the suspect, who is black, the video shows. Watch the tape that lead to the officers’ dismissal » A police mug shot taken five days after the beating was posted on the Web site of The Birmingham News. It shows a badly bruised man wearing a neck brace. Police Chief A.C. Roper told CNN that the video was brought to his attention in March by the district attorney’s office, which stumbled upon the footage as it was preparing for Warren’s trial. Warren was charged with attempted murder, but no trial took place because he pleaded guilty to a reduced charge of aggravated assault. He is in prison serving a 20-year sentence. Roper said he was “shocked” to learn of the video and that it had been around for so long without his knowledge. In addition to a continuing internal investigation that could lead to disciplining supervisors, he said the Alabama Bureau of Investigation is considering criminal charges against the five officers. Langford said the incident brought back to mind days of segregation and police brutality toward blacks. “The culture of the past was that police brutality was acceptable,” Langford said. “In Birmingham, Alabama, in the present day, it is not acceptable.” Langford said the five officers showed exceptional restraint in chasing the fleeing suspect and performed in exemplary fashion until the last scene caught on the video. The camera captured 11 seconds of the five officers beating Warren with their fists and batons. “Those 11 seconds will not be tolerated,” said Langford, who signed letters of termination for the five officers on Tuesday. “Over 50 years of combined police experience gone over 11 seconds,” he said.